Adsense Page Level Ads (Anchor/Overlay Ads and Vignettes) - How to Activate It? Google Adsense has recently introduced the next generation Ads: Page Level Ads. It is a family of ad formats that offer a new and innovative way to help you earn money from your mobile content. These ads are displayed only on High-End mobile devices. It is very easy to activate on your blogs or websites. There is an interesting thing that these ads do not count towards your 3 ads per page limit. 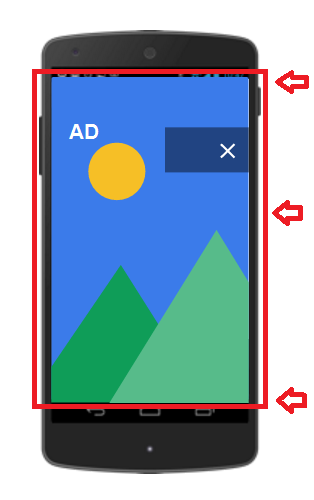 You will learn the tutorial on How to activate page level ads in this post. Before proceeding the tutorial, let me clear you about the main types of Ads that are shown in Page Level Ads. These are the mobile ads that stick to the edge of the user’s screen and are easily dismissable. It is shown at optimal times to help increase revenue and provide a good user experience. These are the mobile full-screen ads that appear between page loads on your site and can be easily dismissed by your users. It is also shown at optimal times to help increase revenue and provide a good user experience. It is shown limited in number to maintain a good user experience. 1. It provides a good user experience. It is shown only when they’re likely to perform well. 2. It requires one time set-up. 3. These additional ads don’t count towards your AdSense per page ad limit. 4. Increase in publishers revenue. How to Activate Page Level Ads? 1. How to Activate Page level Ads for Blogger's blog/website users? 2. How to Activate Page level Ads on Wordpress blog/websites? If you are using Blogger.com as your blogging platform then it will be quite easy for you to activate and add page level ads on your blog or website. 1. Login to your existing Google Adsense account. 2. Navigate to "My Ads" tab. 3. Explore Page-Level Ads tab as shown in below screenshot. 4. Now scroll down the page and click on "Get Code" button. Now you will get the code. Copy that code. 5. Login to Blogger account. 6. Select your blog on that you want to display page level ads. 7. Navigate to "Layout" options. 8. Click anywhere on " Add a gadget". 10. Now paste you code there and click on "Save". You have done. If you are running a blog or website on Wordpress then first 4 steps are similar and same as I wrote for blogger's users. Now you have the code and in the next step you will have to paste this code into your Wordpress based blog before </head> tag. Go to the Admin Panel –> Click Appearance –> Click Editor –> Click "header.php". Now just paste the ad tag right before </head>, and save it. 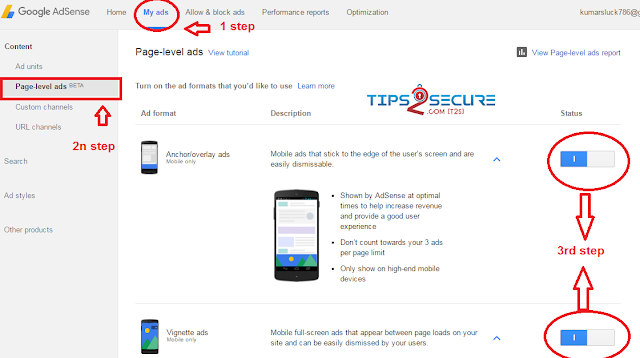 Are you sure the steps you did to activate page level ads correct? If no or you are not sure then you do not need to worry. Here is a step to check if Page-level ads are correctly added on your blog. 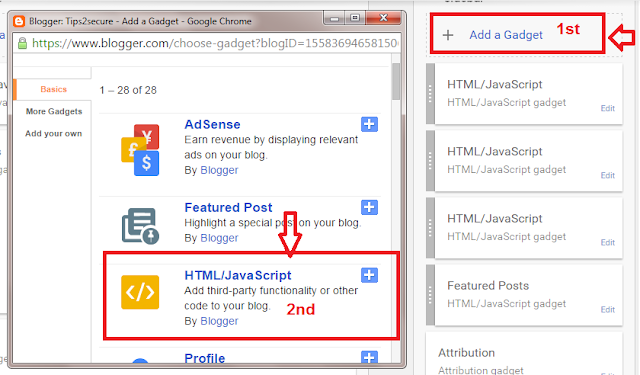 Now, if it starts showing the Ads on your blog means you have done all the things correctly. Just go ahead. I have given my best while writing this tutorial. Still you have any doubt or confusion then you can ask me for the help, I will be happy to help you. Message: I hope that you have enjoyed 'Adsense Page Level Ads (Anchor/Overlay Ads and Vignettes) - How to Activate It?' article. However, if you want me to deliver more items, then please share my post. You can use Social Sharing Widget provided at the end of every post. After all, Sharing is Caring! Google adsense me jo official method bataya gya hai vo alag hai waise maine apke btaye method ko use kiya or test krke dekha to waha sb okay hai but i am not seeing any page level ads in both in my amd your blog when browsing and seeing in some other blog. Again an informational article on Adsense. I just have setup new ad formats for my blogs. I am goging to add these page level ads very soon on my blog. Both the methods are technically same. And these ads are shown at optimal times to provide a good user experience, so do not worry. I am glad you liked this tutorial on Adsense page level ads. Yes, you should try these ads. It will take time. Moreover, these ads are rarely shown and only when it is more valuable for the reader. 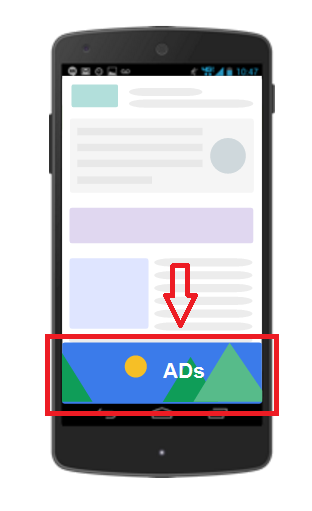 So, it is quite possible that you may not see your ads by yourself but you will have the data in your Adsense performance reports. Hi Suresh, I have optimized in the official google way i. e. before head tag. Now my query is if the page level ads only works for home page or the entire posts. It will depend on your website design. Generally, for wordpress and blogger blogs it is enough to add this tag once in their coding and it works for all post pages. No need to worry, as these ads are rarely shown and only when it is more valuable and useful for the reader. Yes, I have also created a video tutorial for that. Video has been updated in this post. You can check and watch the video tutorial for your help. Sir aapko matched content ads kaise mila,? Mere blog ka rank 50000 ke under hai, fir bhi muze ye ad type nahi mila hai, jabki maine ase kitne blog dekhe hain jinka alexa rank 100000 se zyada hai fir bhi unke blog me adsense match content ads feature hai esa kyu? Hi Suresh,I followed your instructions for adding Page level ads in blogger,but they aren't working. Yes they are working fine when I am testing by putting #googleads. Please suggest.